The Mourne Mountains in Ireland are not well known. A small, crumpled clutch of mountains tucked into the east coast of Ireland, the Mournes burst up from sea level to 850m above. The autumn terrain is mud and granite. Huge, imposing boulders, and bleak, beautiful vistas coupled with the endlessly threatening weather of the foothills all create a truly atmospheric setting for a Skyline race. The Garmin Skyline is a young race - only in its 4th year - but the course is up there with the toughest and most established trails in Europe. Stretching 35km, with 3350m of vertical elevation gain, and terrain that gives no let up bar a couple of km of road around the halfway mark. 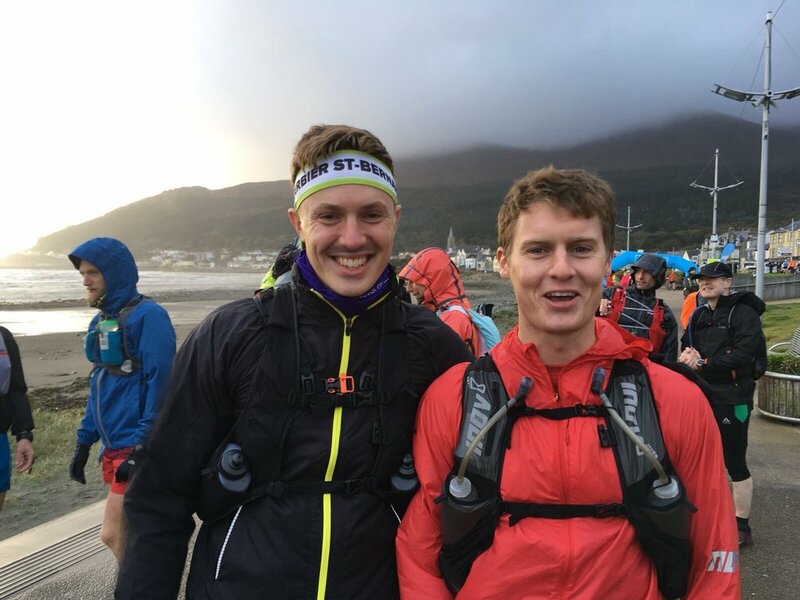 Standing at the start line, the sharks tooth elevation profile is both alluring and intimidating - a combination which meant the race sold out its 250 spaces in less than 15 hours. I was fortunate to get a space, along with a good friend Lewis, and we managed to convince a few friends to also fly out to Ireland with us for a weekend of steep mountains and heavy Guinness. The Trip started very, very well. By this, I mean that the Nissan was uexpectly upgraded to an Audi and that Lewis was also lucky enough to have a friendly ex-colleague with a spectacular house; all just 20 minutes from the start line and available for the Friday and Saturday night. The Girlfriend and myself flew out on Friday, and met Lewis at the airport. The next challenge was to locate Henry and Josh, who had spent the day exploring Dublin’s finest establishments, and then where unable to work out which level of the airport they where on. Still, eventually, the five of us were on the road, and we drove the hour or so up to Newcastle, and got a early night ready for the following day. Saturday broke wet and windy. A quick drive to the start line quickly put us at the foot of the hills, and all we could see were clouds shrouding the craggy slopes above…. The wind was howling and the organisers cheerfully reminded us that forecast was getting worse in the afternoon. The plus side of which was a good incentive not to take to long on the route! After a quick check in, and some inspiration from Josh, Kate and Henry (the support team) we lined out along the promenade, and with the sun peeping through the clouds for the first time that day, we set off up the mountains. The pace started nice and chilled, with a lead group of four of us quickly forming and we climbed the 600m or so up and then to the Hares Gap. The climb was gentle following a stream up a large gully, and once cresting the ridge line, I found out just how good the local runners were in these mountains. The two leaders flew down the ridge line - and the skill required to navigate those trails in that weather was, quite frankly, awe-inspiring. 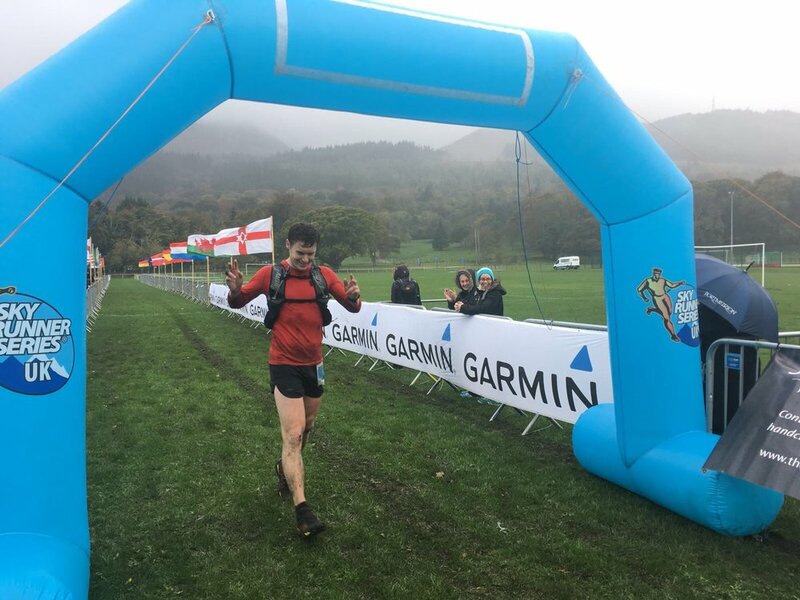 I quickly made a call to not kill myself trying to keep up, and chose to take the descents at a safe pace, something that paid off hugely as the race wore on. From here the course was relentless. A unique feature of the Mournes are the imposing granite walls that criss-cross the hills, and the course followed the wall - something I found oddly comforting, but this may just be due to the shelter from the biting wind that the ancient structure gave. The first half of the race was the more gentle, with only 2 of the 10 peaks in the first 18km. One of the best features of the entire course was the army of friendly marshals, who stock with jelly beans and encouragement that helped runners on. I was blown away by their commitment, with many probably having a tougher, and certainly longer day out than the runners! The climbs did not stop, and the underfoot conditions were the most testing I have been in. The storms that had battered the country, combined with the torrid conditions on the day meant that the descents were lethal, and often far slower than the ascents. Scrambling up the steep slopes, half climbing, was respite compared to slipping and falling down the other sides. 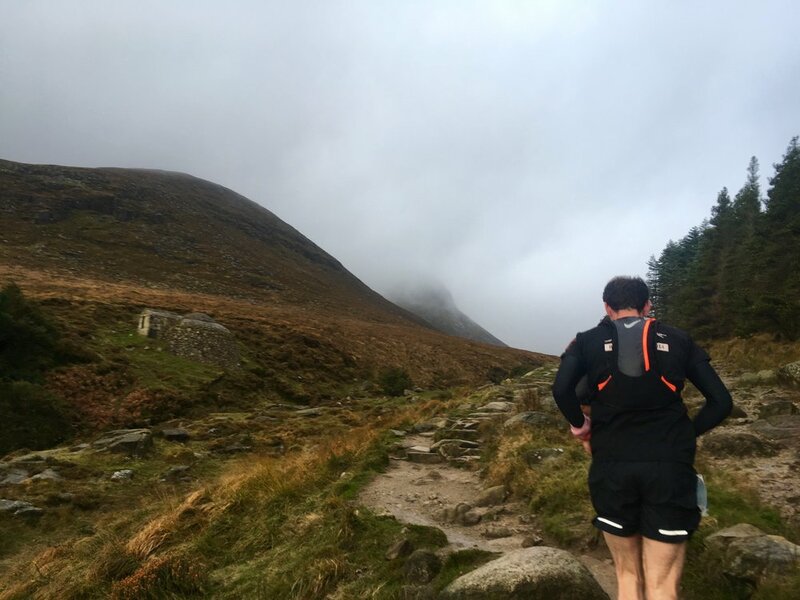 At around 25km, I took my first proper fall in a mountain race, slipping about 80 meters down the side of Slieve Bearnagh. It was a wake up call. Normally I am very relaxed up in the mountains, and have rarely been concerned, but up here, with about 40 meters of visibility, soaking wet, both knees bleeding profusely, and a shoulder I couldn’t really move, I felt a bit of concern slip into my mind. Limping down to the next valley, I got myself back together, and began the penultimate, and worse climb of the day. You know the type: the ones that just don’t seem to stop. My toys where dangerously close to flying out of my pram, and probably tumbling down with the rest of me. It was here that I was overtaken by another couple of runners. The skill and guts it took to descend quickly gave me huge respect for all the runners, and those that showed me up on the route, well, I was happy to lose to them! The last climb of the day was up Sleive Donnard, the highest peak in the Mourne’s at 850m, but after the the penultimate climb, it seemed almost a breeze to get up to the top. From here is was a descent all the way back to sea level, and with rapidly worsening quads, I skipped down the the same path we climbed up 4 hours previously. From here a short gravel section gave way onto the local playing fields and the 200m sprint to the finish line where Josh, Kate and Henry where waiting, getting far too excited about Facebook live, and a mis-timed warm-up jog meant Kate ran me in for the last 100m or so. Josh had Facebook live up for my finish and did make a valiant effort to interview me after I had finished, but I don’t recall being overly talkative! I came in 7th, in a time of 4:36, and far better than expected. For reference the winner, Ian Bailey, got 3:57, which is credit to an absolutely stunning preformance. After the excitement of finishing, I realised that my girlfriend had already put on every warm bit of clothing I owned, so I found what I could, got a pint of Guinness in me and went to wait for Lewis at the finish line. The Big Man come storming over the line in 46th place, in a time of 5:51. Both of us agreed the course was both horrendous and incredible, and that Lewis’ run was a stellar effort in his first Skyrace. Talking to Lewis after, he had many of the same feelings as me about the race, and both of us agreed it is a chanllenge we would come back to face again.The 3350m of vertical gain in the 35km made it the steepest race he had down so far, and to come in 46th was a phenomenal effort. He paced it to perfection, and came across the line looking really strong, if a little bit cold, nothing a beer didn’t fix. What followed involved a huge amount of food, a few to many beers, a epic nightclub in a random Irish town, and the ineveiable, unwelcome arrival of DOMinic in the morning. For those of you who aren’t familiar with Dominic, He’s that annoying guy that rocks up one to two days after races and means you walk like a idiot. If I am to give any budding mountain runners any advice, it is to not go out partying after a big race. It totally ruins your recovery. The Garmin Skyline was a epic race: the course was incredible, and truly challenging. The people who ran, and organised the race, and supported where phenomenally friendly and welcoming to everyone who passed their way: runners, hikers and limpers alike. A huge shout out to the marshals too, they where so happy and encouraging, despite sitting on a wet, cold mountain for over 8 hours. The course is one of the best I have run, and packs a huge punch despite its relatively short distance. 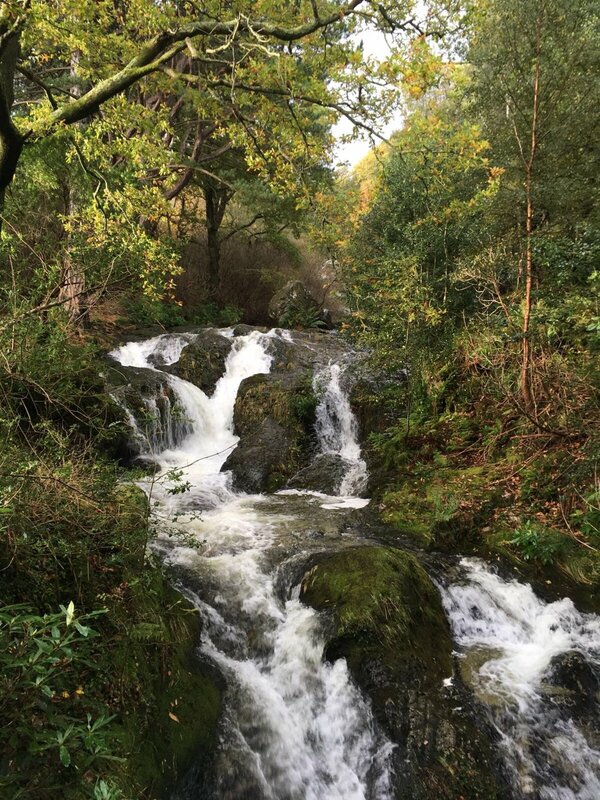 While the weather was far from ideal, it was still beautiful, and a welcome chance to see a less explored part of the UK (it’s in Norther Ireland….). If I’m quick enough to enter again next year, I’ll certainly be toeing the start line again!